I grew up in a college town and then went to that university after high school. There’s something special about following a team for so many years, especially when your relatives went to the same school! I love how exciting the games can be and especially when your team scores! It’s sort of sad when football season has to come to an end but we still have one more game to watch, the BIG GAME! Why not host a party like I am. It doesn’t have to be fancy. I’m serving my family’s favorite snacks! 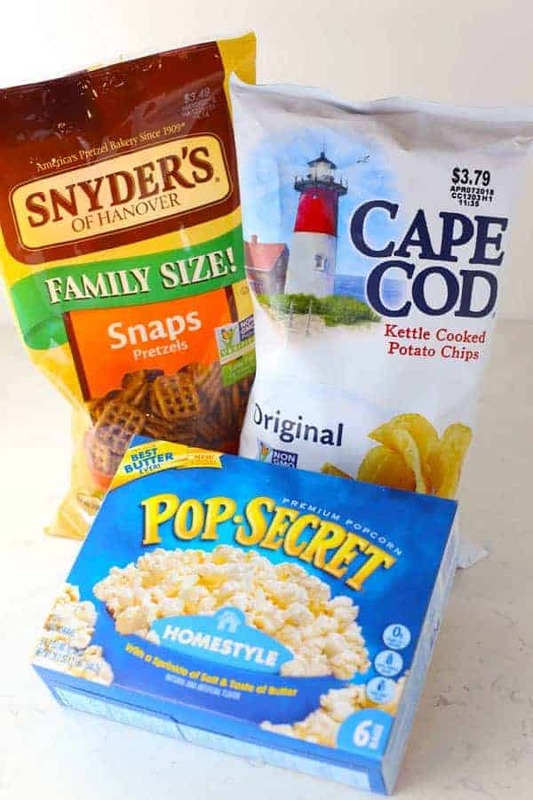 My husband LOVES Snyder’s of Hanover® Pretzels, my son is a very big fan of Pop Secret® Popcorn and Cape Cod® Potato Chips are my daughter’s favorite! 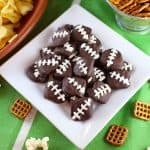 These are also my GO-TO party snacks when I want to throw a celebration together in a hurry! No party is complete without chips and dip. My hubby is crazy about French onion dip. 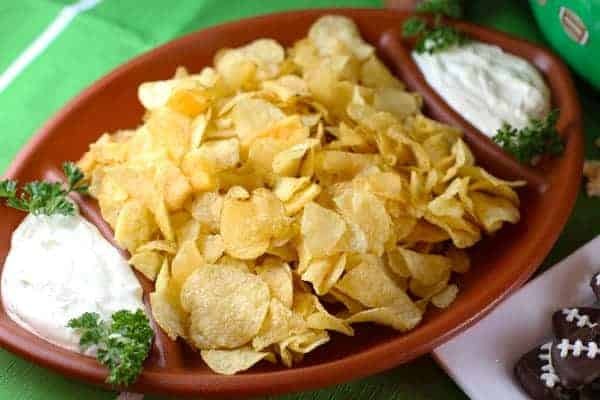 I bought some that was pre-made at the grocery store, so all I had to do was just scoop it onto my serving platter, then add the delicious Cape Cod® Potato Chips. I chose the original flavor but they’re also available in Sea Salt & Vinegar, 40% Reduced Fat Original or Sea Salt & Vinegar, and Waffle Cut Sea Salt. Popcorn is also a super snack to eat while watching the game. I used Pop Secret® Popcorn which is so easy to make in the microwave. And fast too! I chose the HOMESTYLE flavor. It also comes in Butter, Extra Butter, Movie Theater Butter and Better Than. This treat is literally as easy as 1-2-3. First you melt chocolate chips, stir in a little oil and dip the pretzel snaps. Then you let them chill in the fridge for about an hour. 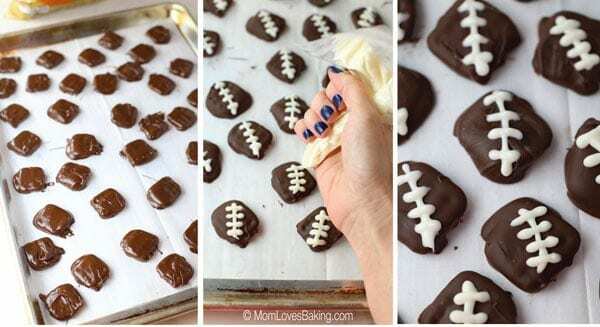 Lastly, you melt white chocolate and drizzle lines to create the football laces. Easy peazy! 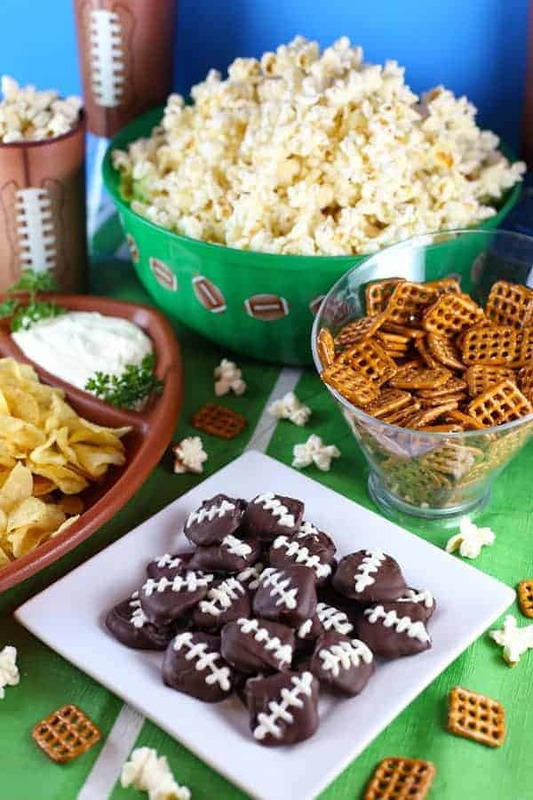 This recipe makes 40 Game Day Pretzel Footballs. Need more? Simply double the recipe to make sure you have plenty to go around. They will keep for at least a week if you store them in an air tight container or plastic bag. Who do you hope will win the BIG GAME? Let me know in the comments. I love hearing from you guys and may the best team win! Line a large sheet pan or cookie sheet with raised edges with parchment or waxed paper. Set aside. Melt chocolate according to package instructions. (I put the chocolate chips in a medium sized glass bowl and microwaved the on high for 30 seconds. Stirred them, then microwaved for another 30 seconds. Stirred them and microwaved for another 15 seconds.) Stir until all the chocolate chips are melted and you have a smooth consistency. You might have to microwave them for another 10-15 seconds but be careful not to burn the chocolate because then it will be too thick. Stir in the oil until completely combined. 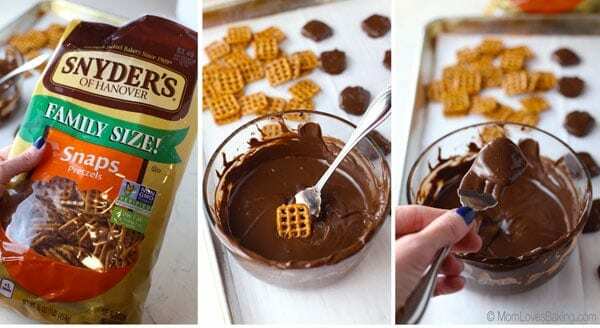 Dip one Snyder’s of Hanover® Pretzel Snap at in time into the melted chocolate. Use a fork to scoop it out and tap gently to let excess chocolate drizzle off. Place chocolate covered pretzel on the prepared pan. Repeat with remaining pretzels and chocolate. Refrigerate for about an hour. Once they are chilled, melt the white chocolate. BE VERY CAREFUL not to microwave it too long. White Chocolate burns very easily (I burned it the first time I tried it). Microwave for 10 seconds. Stir. Microwave for 10 more seconds. Repeat. Stir until smooth. Pour into a zip top plastic bag and seal. 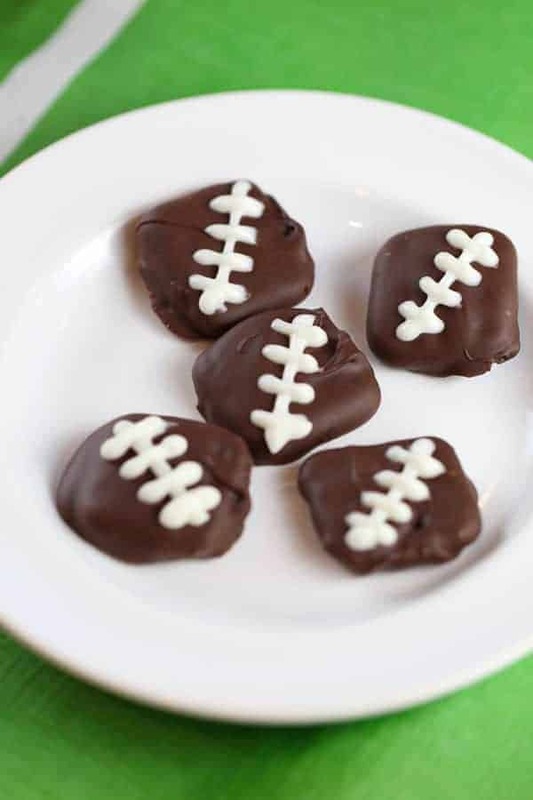 Cut a very tiny corner off and drizzle laces onto your chocolate "footballs". Refrigerate for 15 minutes and serve. Store covered at room temperature for up to 7 days. 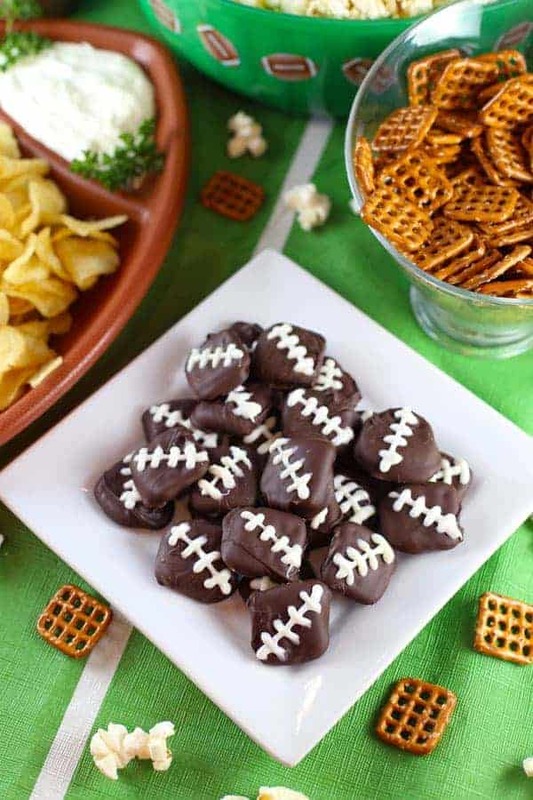 Those football pretzels are adorable and look so easy to make! Thanks for sharing. Those are adorable! Love a sweet and salty combo! 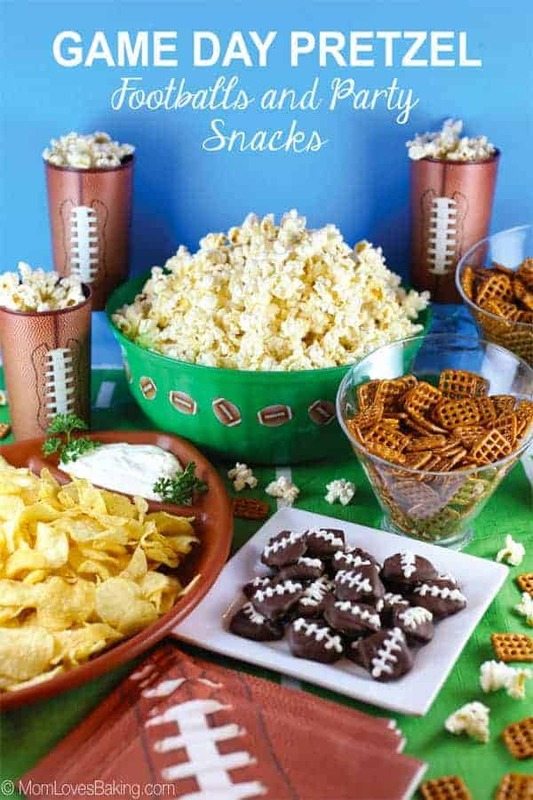 Loves the wonderful snack ideas, perfect for game day!